I am SO excited to share this top secret recipe post with you today! This is a Freaky Friday Recipe Swap that I did with 19 of my blogger friends. We all were assigned a blog to make a recipe from, and today we are ALL sharing our posts, and who we had! How fun is that? The blog I was assigned was A Kitchen Hoor. This was a new to me blog that I was SO happy to explore! I absolutely LOVED so many of Christie’s recipes. It was really difficult to pick just one. The Ultimate Mushroom Swiss Patty Melt, Tex Mex Beef Stir Fry, and Creamy Cajun Pasta With Sausage are 3 that caught my eye right away. But my hubby was going out of town for a week and as soon as I saw her Bacon Cheeseburger Mini Meatloaf Patties, I KNEW I had to make them for him before he left! Oh my goodness! He was in heaven and so were the rest of us! We served it with My Granny’s Green Beans and Fried Potatoes. It was a match made in heaven! 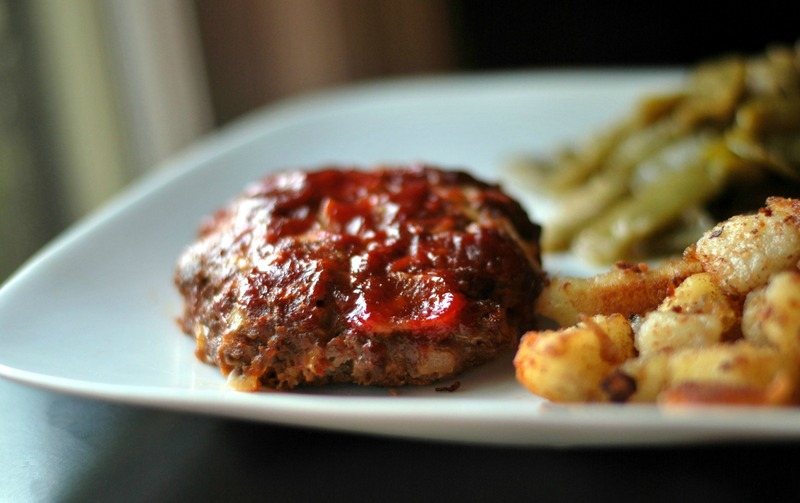 I couldn’t believe how easy and delicious the Bacon Cheeseburger Meatloaf Patties were! The next day, the leftovers made the absolute best meatloaf sandwiches that I have ever put in my mouth! 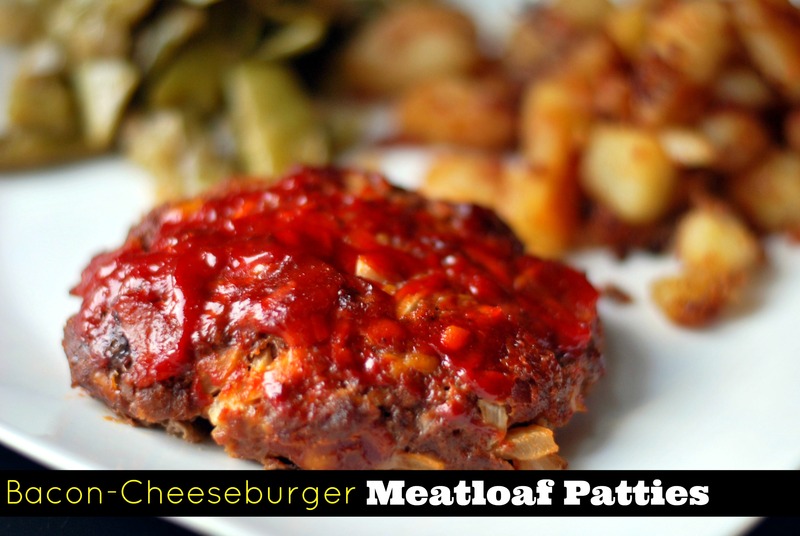 If you like meatloaf and cheeseburgers, you GOTTA give this a try. You can thank me later! Combine the ground beef with the onion, bacon, cheese, and egg in a mixing bowl. Add 1/2 cup of the ketchup and the remaining 6 ingredients (Worcestershire through smoke flavor). Fold the beef mixture gently until incorporated. Divide into 6 patties and place on a roasting pan with a rack covered with aluminum foil and sprayed with cooking spray. Using a basting brush, cover the meatloaf patties with the remaining ketchup. Bake at 400 for 35 to 40 minutes or until the patties reach your desired level of doneness. I can not wait to pop over and see what everyone else from the group made! Here are the list of my friend’s participating! Brandi Burgess, A.K.A. 'Aunt Bee' has been married to the love of her life for 10 years. A Birmingham, Alabama native, She and her husband helped run her parent's successful business for 8 years before finally spreading their wings and setting out to make it on their own. They moved to Huntsville in 2012 where is a stay at home mom, to their 2 kids ages 10 and 5. She has a passion for cooking for her family and trying new recipes. These looks sensational! My family would LOVE them! Great pick! We love these, too. They do make the best sandwiches. Now you know why I don’t eat out for lunch. Thanks for your kind words. I’ve been following your tasty goidness , too. This looks so good. Can’t wait to try it! I am literally drooling over this! So much yum! These mini meatloaf patties look delicious! My husband would love this too, and I love the idea of leftovers for lunch! Oh this is definitely happening at my house soon, my husband would LOVE it! These look great! What a fun family recipe to make for this great blog hop! I am loving this recipe!! Super family friendly and I know for sure my boys will love this!! I really love Christie’s blog…she has so many great recipes on there. And lots of comfort food!! I know my family is going to love this one for sure! OH yeah… These are going to be made in my house! Definitely a hit! Our family would and will be all over this one! Wowsa!!! Fantastic recipe here, Brandi! I love how easy this recipe is! I LOVE meatloaf and I have to try this recipe. Wow, these look amazing! I’m totally making them for dinner soon. That sauce on top is calling my name! We LOVED these. Made them last night with the following changes: used real bacon bits (feeling lazy), I chopped the onion and then cooked it in oil before adding (I had leftover chopped onion in the fridge that needed to be used and my kids would eat it better with it cooked before adding.) Everything else was followed and it was really good. Will go on the rotation for sure. How would it taste without the liquid smoke ?